Seven of Ramsey's nine goals in all competitions this season have come at Emirates StadiumFrance striker Alexandre Lacazette marked his first Arsenal start for two months with two goals as they took control of their Europa League quarter-final by demolishing CSKA Moscow in the first leg.The Gunners scored four first-half goals, Aaron Ramsey's side-foot finish setting them on their way.Aleksandr Golovin levelled with a sublime free-kick before Lacazette, who has recovered from a knee injury, made it 2-1 with a penalty after Mesut Ozil was fouled by Georgi Schennikov. Ramsey produced a brilliant third with an instinctive volleyed flick, with Lacazette adding a fourth after being picked out by the outstanding Ozil.Arsenal were unable to add to their tally in the second half but they will head to Russia's capital for the second leg next Thursday with a commanding lead. 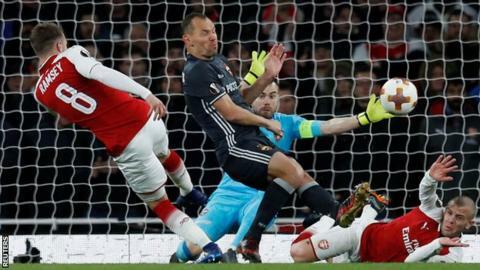 Arsenal, who have won five successive games in all competitions, should have triumphed by a more handsome margin in what was a cracking match.Henrikh Mkhitaryan missed a great chance early in the second half, while Ramsey fired over the bar after keeper Igor Akinfeev had spilled the ball into his path.Ramsey's hopes of a hat-trick disappeared when his curling 77th-minute shot hit the post.Nevertheless, Arsene Wenger's side will be confident of reaching the semi-finals of a competition that provides a team sixth in the Premier League - 13 points off fourth place with seven games left - with their most realistic chance of qualifying for next season's Champions League.Arsenal are certainly warming to the Europa League, collecting their eighth win from 11 games in the competition, scoring 27 times and conceding eight. Assuming there is no second-leg upset in Russia, they still need to negotiate a two-legged semi-final to reach the final in Lyon on 16 May.Yet the way they dismantled CSKA, who started their European campaign in the Champions League, was impressive although victory came at a cost.Wenger confirmed after the game that keeper David Ospina, who suffered an ankle injury on the eve of the game, will be out for between two and three weeks while Mkhitaryan, who was substituted, will miss Sunday's game against Southampton with a damaged knee. Ramsey has been directly involved in 16 goals in all competitions for Arsenal this season (nine goals and seven assists)There have been some spectacular goals in Europe this week.Cristiano Ronaldo's superb overhead kick for Real Madrid against Juventus in the Champions League followed Alex Oxlade-Chamberlain's rocket shot for Liverpool against Manchester City.Ramsey's second goal was also sumptuous.The Gunners were leading 2-1 when the Wales midfielder, spotting Akinfeev off his line, lifted the ball over the CSKA keeper from Ozil's wonderful pass.It was an audacious first-time finish and it left CSKA deflated as the Russian side conceded four goals in the space of 26 minutes.Ramsey had scored the first of Arsenal's four first-half goals with a finish high into the net and the midfielder, who scored against AC Milan in the last round at the San Siro, now has nine for the season.He also had a goal ruled out for offside while the game was goalless before Arsenal went on to deliver a masterclass in attacking football. This was the first time Arsenal scored four goals in the first half of a European game since December 2004 against Rosenberg in the Champions League group stage. The Gunners have won five matches in a row in all competitions for the first time since a run of six victories ending in May 2017. Arsene Wenger's side have won three consecutive knockout games in European competitions for the first time since 1999-2000, when they won four successive matches in the Uefa Cup quarter-finals and semi-finals. CSKA Moscow have now lost four successive European matches on English soil, shipping 10 goals in the process. Alexandre Lacazette has scored 10 goals in his last 13 Europa League appearances, these being his first two for Arsenal in the competition (after scoring eight for Lyon). Match ends, Arsenal 4, CSKA Moscow 1. Posted at 90'+4' Second Half ends, Arsenal 4, CSKA Moscow 1.Posted at 90'+2' Offside, Arsenal. Nacho Monreal tries a through ball, but Danny Welbeck is caught offside.Posted at 90'+2' Foul by Granit Xhaka (Arsenal).Posted at 90'+2' Aleksandr Golovin (CSKA Moscow) wins a free kick in the defensive half.Posted at 90'+1' Alex Iwobi (Arsenal) wins a free kick in the defensive half.Posted at 90'+1' Foul by Georgy Schennikov (CSKA Moscow).Posted at 90'+1' Foul by Nacho Monreal (Arsenal).Posted at 90'+1' Georgi Milanov (CSKA Moscow) wins a free kick in the defensive half.Posted at 89' Attempt missed. Pontus Wernbloom (CSKA Moscow) left footed shot from outside the box is close, but misses to the left. Assisted by Konstantin Kuchaev.Posted at 85' Attempt missed. Aaron Ramsey (Arsenal) left footed shot from the left side of the box misses to the right. Assisted by Alex Iwobi.Posted at 84' Attempt saved. Danny Welbeck (Arsenal) right footed shot from very close range is saved in the centre of the goal. Posted at 83' Substitution, CSKA Moscow. Khetag Khosonov replaces Ahmed Musa.Posted at 82' Mesut Ozil (Arsenal) wins a free kick in the defensive half.Posted at 82' Foul by Georgy Schennikov (CSKA Moscow).Posted at 79' Attempt missed. Vitinho (CSKA Moscow) header from the centre of the box is just a bit too high. Assisted by Georgi Milanov with a cross following a set piece situation. Posted at 78' Hector Bellerin (Arsenal) is shown the yellow card for a bad foul.Posted at 78' Foul by Hector Bellerin (Arsenal).Posted at 78' Pontus Wernbloom (CSKA Moscow) wins a free kick on the left wing.Posted at 77' Aaron Ramsey (Arsenal) hits the right post with a right footed shot from the centre of the box. Assisted by Alex Iwobi.Posted at 75' Shkodran Mustafi (Arsenal) wins a free kick in the defensive half.Posted at 75' Foul by Vitinho (CSKA Moscow). Posted at 74' Substitution, Arsenal. Danny Welbeck replaces Alexandre Lacazette. Posted at 74' Substitution, Arsenal. Mohamed Elneny replaces Jack Wilshere. Posted at 74' Igor Akinfeev (CSKA Moscow) is shown the yellow card. Posted at 74' Substitution, CSKA Moscow. Georgi Milanov replaces Bibras Natcho.Posted at 73' Offside, Arsenal. Mesut Ozil tries a through ball, but Aaron Ramsey is caught offside.Posted at 73' Attempt saved. Mesut Ozil (Arsenal) left footed shot from the right side of the box is saved in the bottom left corner. Assisted by Alexandre Lacazette.Posted at 71' Attempt saved. Nacho Monreal (Arsenal) header from the centre of the box is saved in the top right corner. Assisted by Mesut Ozil.Posted at 69' Alex Iwobi (Arsenal) wins a free kick on the left wing.Posted at 69' Foul by Vitinho (CSKA Moscow).Posted at 68' Attempt blocked. Alex Iwobi (Arsenal) right footed shot from the left side of the box is blocked.Posted at 67' Offside, Arsenal. Alex Iwobi tries a through ball, but Alexandre Lacazette is caught offside.Posted at 66' Foul by Alex Iwobi (Arsenal).Posted at 66' Konstantin Kuchaev (CSKA Moscow) wins a free kick in the defensive half.Posted at 65' Offside, CSKA Moscow. Sergei Ignashevich tries a through ball, but Ahmed Musa is caught offside.Posted at 65' Foul by Granit Xhaka (Arsenal).Posted at 65' Aleksandr Golovin (CSKA Moscow) wins a free kick in the attacking half. Posted at 65' Substitution, CSKA Moscow. Vitinho replaces Alan Dzagoev.Posted at 64' Offside, CSKA Moscow. Pontus Wernbloom tries a through ball, but Alan Dzagoev is caught offside.